As usual in May, I take a look at last episodes of seasons or series. I love doing this because I am fascinated with how TV series end their run. I am curious about how writers decide to wrap up their characters and story lines. Yet sometimes, a series may just end but leaves us, the viewer, with the impression that the character’s lives just go on and on. We get that with the very last episode of The Good Life. There isn’t any real finality to the lives of Tom, Barbara, Jerry or Margo but yet it is one of the most unique final episodes of any TV series and in some ways one that left me a little depressed. 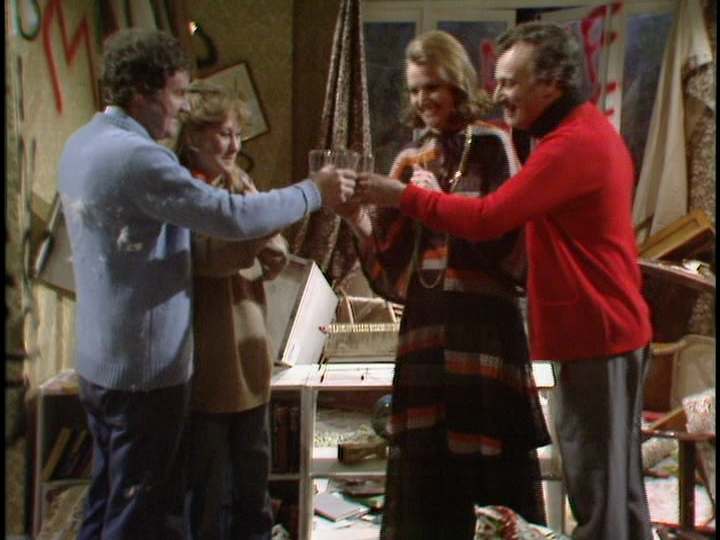 What I personally consider the final episode of The Good Life ran in May 1977 with an episode called The Anniversary. It was the two year anniversary of Tom and Barbara deciding to give up their lives as what would be normal suburban life and become completely self-sufficient. This means that Tom gives up his job and both he and Barbara make everything themselves. What they cannot make they will barter. It had been a tough 2 years with the final episode having their home ransacked. 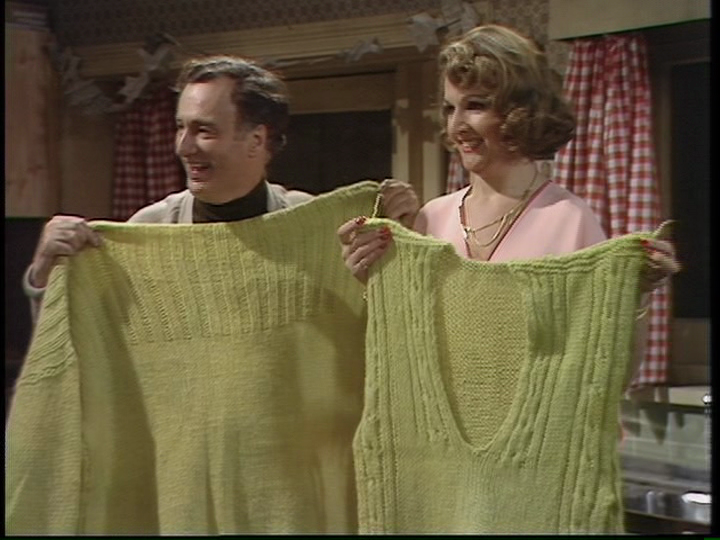 It was a very serious end to a series that had been so funny yet also poignant as Tom & Barbara even after all of this decides to stick with the self-sufficiency lifestyle. They even toast the occasion to the good life. It is a marvelous ending to a TV series but it wasn’t quite over yet. The Good Life returned around Christmas of that year with Silly, But It’s Fun…. This Christmas episode had the Leadbetters sharing Christmas with the Goods because the Leadbetters had no decorations, food or drink due to an oversight. Would this be the final episode of the series? No, not yet and the next one was going to be really interesting. How interesting does it get? Not only is this really is the final episode of the series but it is done in a way of such grandeur that has not been seen on any comedy before. This is a Royal Command Performance. What this means is that Queen Elizabeth II was in the audience along with The Duke of Edinburgh. 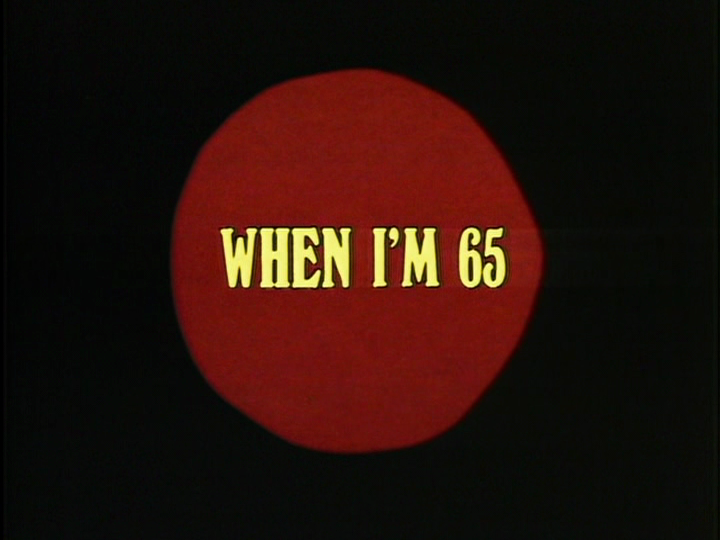 This is a very interesting production because the actual episode, When I’m 65, actually feels very secondary to the whole production. 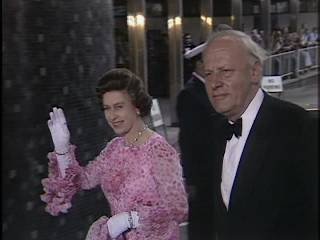 The episode starts off with a shot of BBC Television Centre as it appeared back in 1977 and shows the Royal Rolls-Royce entering the BBC Television Centre grounds containing the Quees and Duke of Edinburgh. The whole event has a commentary given by Brian Johnston who was a commentator for the BBC from 1946 to 1993. He did a lot of commentary on cricket matches and was a very well-known voice to millions. 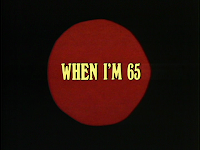 To my knowledge, this episode wasn’t always included in the syndication package for PBS. If it has, maybe it was just the episode stripped out. I have to admit, I didn’t follow the series that closely on PBS in the 1980s but when I was watching it in the 1990s I saw it, I was really surprised. I didn’t pay too close attention to some of these series in my TV Guide when they were on PBS, at least not The Good Life. I didn’t always look in the listing magazine to see which episodes were going to air that week. I was watching the series and one night I tuned in and it was the Royal Command Performance! 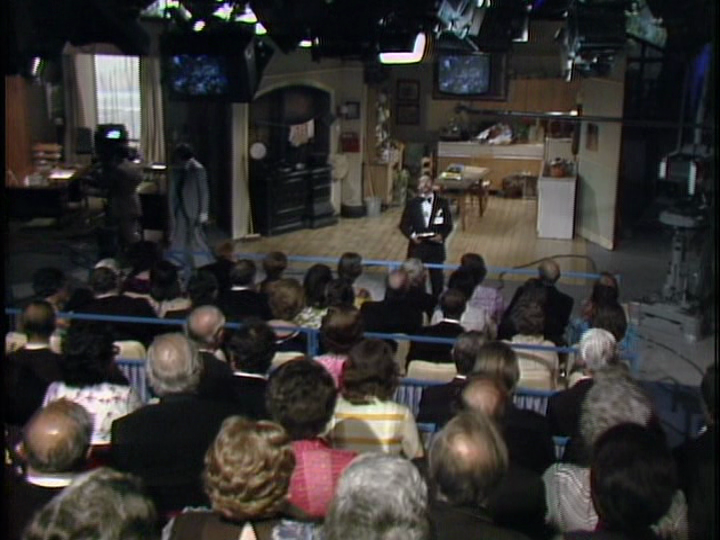 Why this was so interesting to me was that it had BBC television Centre in it and literally showed us what the studio was like prior to record an episode of The Good Life! I by no means have ever hid my love for BBC Television Centre. Obviously in many BBC programs, the iconic building would show up from time to time. 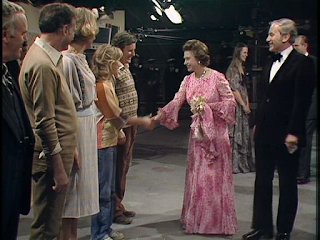 I rarely got to see inside so it was really fun to watch cameras following the Queen into the main reception and eventually into TC6, studio 6, which is where they recorded the episode. 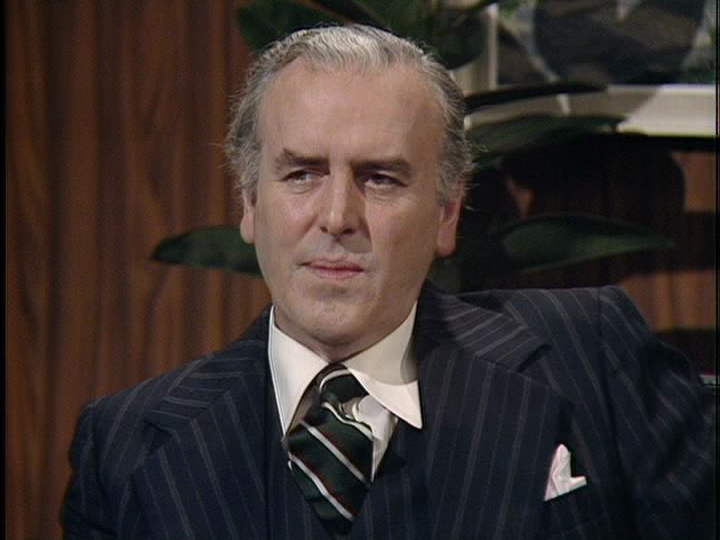 I have been now spoiled with a ton of imagery of the inside of BBC Television Centre over the past year leading up to its closure so to be honest, there is a lot less of the interior than I remembered in this special episode. Back when I first saw this I thought it was the bee’s knees. It’s still cool but there is just a lot of footage of the Queen and the Duke of Edinburgh meeting people. Not exactly riveting viewing for me but if you like it, great. One of the highlights of this section is when production assistant Brian Jones explains to the audience how television production works. Everyone in the studio is dressed in their finest which really gives the production a very momentous feel to it. It’s odd though as, to me; some of the shots of Brian explaining the process of making television seem soft and out of focus. It seems like it is just one camera. The only people who are not dressed up are the actors because they are dressed for their roles in the production. Brian Jones walks us through the sets, if you were in the audience, where you could view footage that was already shot or from sets that needed to be “double banked” which means sets that are hidden behind other sets outside the view of the audience could be seen on small monitors above all the action. It really shows us how minimal these productions really are when produced. When I watch these shows, I don’t count how many sets where in the episode but watching Brian Jones, it shows that there really isn’t that many at all. Brian does introduce Richard Briers who in turn introduces the rest of the cast. When it is just Richard and Brian talking, Richard makes some joke about Jimmy Saville and I am not sure if it is a Jim’ll Fix It joke or not. Trust me, I am not alluding that his joke had anything to do with the unfortunate information that came out about Saville over the last year, it’s just the joke made no sense to me. After about 10 minutes of set up, the episode begins. Basically the episode focuses on how Jerry is planning on living with Margo once in retirement. He is getting a physical and realizes he is not in as good of health as he thought. All this got Tom to think about how he going to provide for Barbara when they reach pensioner age. As it is, they don’t make any money at all especially trying to be self-sufficient. This had really got him worried so he decided to go to his bank and try to sort out this problem. At the bank he speaks with the bank manager, Mr. Downs, about the bank giving Tom £2,000/year which the bank will then own his home once he dies. Of course now there are programs which are actually along these lines but back then not so much so. Mr. Downs does not see the benefit for the bank to go along with this plan. For example, part of Tom’s plan includes an age Tom and Barbara will be dead for the bank to take over their house. Mr. Downs inquires what happens if their deaths are not so punctual and they live a lot longer. Needless to say, Tom leaves the bank without a plan but does take £3 out of his account to buy flowers for Barbara. Granted he only had something like £3.80 in his account. The episode ends with Tom and Jerry trying to outdo each other by running a race. Jerry is on a health and exercise kick to get into shape and thinks he can easily take on Tom. Tom thinks he can easily take on Jerry and suggest an even more ambitious route than Jerry did for their race. The next day, they start the race and they are off! They eventually can’t handle the running anymore; each one is completely exhausted and they stop into the nearby pub! Margo and Barbara are waiting at the finish line outside their houses when the see Tom and Jerry neck and neck running towards the finish line. It’s a tie! Both of their egos are intact and they turn to go into their houses but are stopped as a taxi comes up to them. The driver yells out to them that one of the two left their wallets in the car! The special ends with the Queen meeting with each of the actors and production staff and then she goes home. The actual episode itself is alright but only alright. To me, everything that made The Good Life was not in there. There was nothing about Tom and Barbara trying to make ends meet by working out in the back garden. I suppose because this was a one-off episode that the production team made a conscious decision not include ripping up someone’s garden just for one episode opposed to a whole series. That being said, even with all the characters in it I just did not find it overly funny. 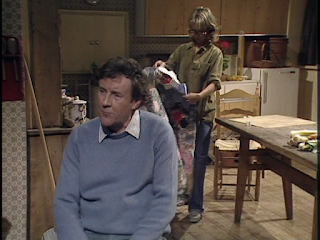 The Good Life is a hilarious series but there really wasn’t any laugh at loud moments for me. It was alright but almost seemed like it ran out of steam. There was the scene with Tom talking in the kitchen looking into the fire with Barbara with him moaning about becoming an old man and Barbara puts a blanket over him and has him clutch a an umbrella that looks like a cane. Tom realizes what he is describing is what Barbara made him look like. It’s contrived and it was trying too hard which is not a characteristic of this series. A lot of the story seemed that way to me. I really felt it’s heart wasn’t in it. 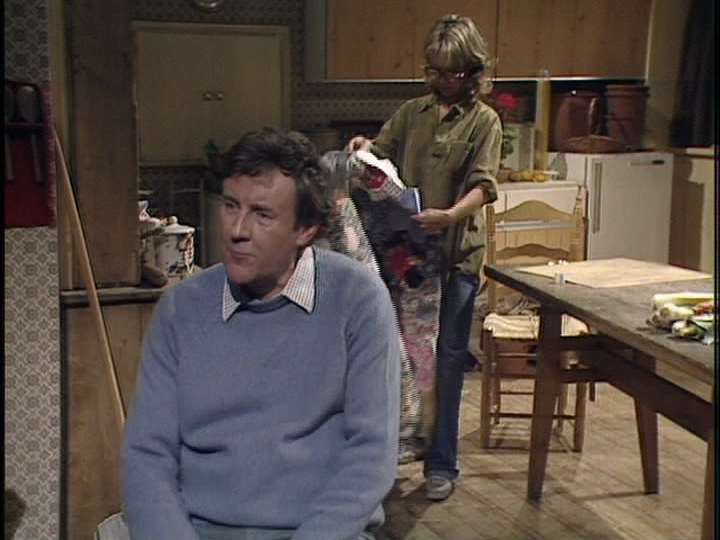 I did notice that in a few scenes Barbara was doing a lot in the background that was kind of like doing chores. This falls more in line with what I thought was missing from the episode, for example at one point in the kitchen she is cutting up potatoes and in another scene she is sewing. Margo at this stage basically has a To The Manor Born haircut. She looks more like Audrey fforbes-Hamilton than Margo Leadbetter. It’s funny because when I saw this performance for the first time, it was the first time I ever saw this series with its original title in the title sequence. Over in the US, it was always Good Neighbors. The title sequence was changed for transmission over here in the US. Of course on the R1 BBC DVD sets they have the correct titles but the series was originally released on R1 on Acorn Media and they used the old PBS syndication masters which had Good Neighbors on the title. Those episodes even had the Lionheart logo at the end of the episodes. The R1 DVDs have the title of Good Neighbors on the packaging but the actual episodes on the DVDs have the proper title sequence. The reason that it was not brought over to the US as The Good Life was because there was a short-lived Larry Hagman series called that and didn’t want to confuse anyone. At least that is what I have always been told. 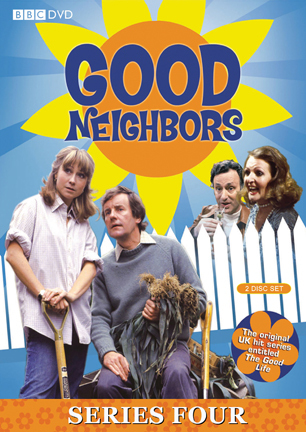 I suppose with the series still in syndication in the US, it is still called Good Neighbors since that what so many people has known it as for so long. The subject of the episode left me a little uneasy. 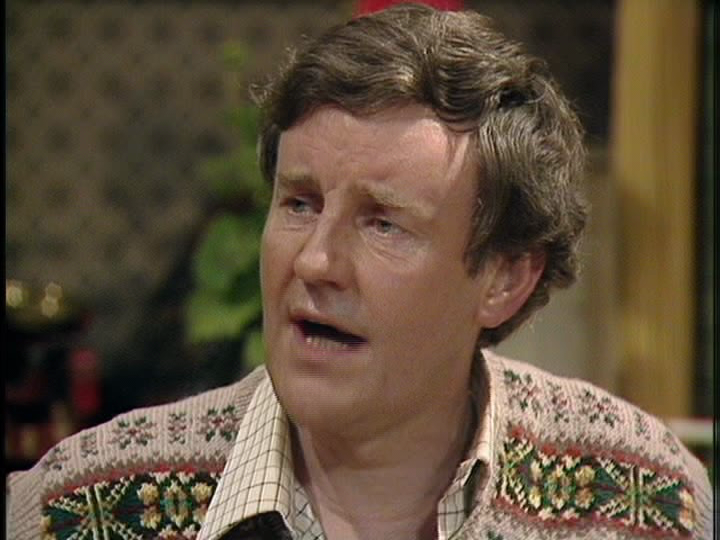 This is the first time I have watched The Good Life since Richard Briers passed away in February of this year. 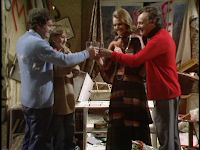 The episode talks about these characters dying and even Tom working out a plan so both him and Barbara can have money to live up to the age of 85. Richard Briers passed away at age 79. It’s pretty lame to not separate a character from the actor but in this case it is really difficult. I thought the same with Paul Eddington when I watched this the first time. When I worked at the corporate campus of Best Buy there was a guy who I worked with named Peter. He always reminded very much of Richard Briers or perhaps more so Tom Good. Peter is a guy who has good energy and even when dealt with stupid or bad situations, he didn’t let it get to him. He always found a way to solve problems with a kind word or perhaps being a little silly at his own expense just to make things better. He is a good guy who I think of every time I watch this series. He eventually became my boss for a while and then he left to work somewhere else. I have lost touch with him over the years but I think if anyone has the qualities of Tom Good, there doing alright. 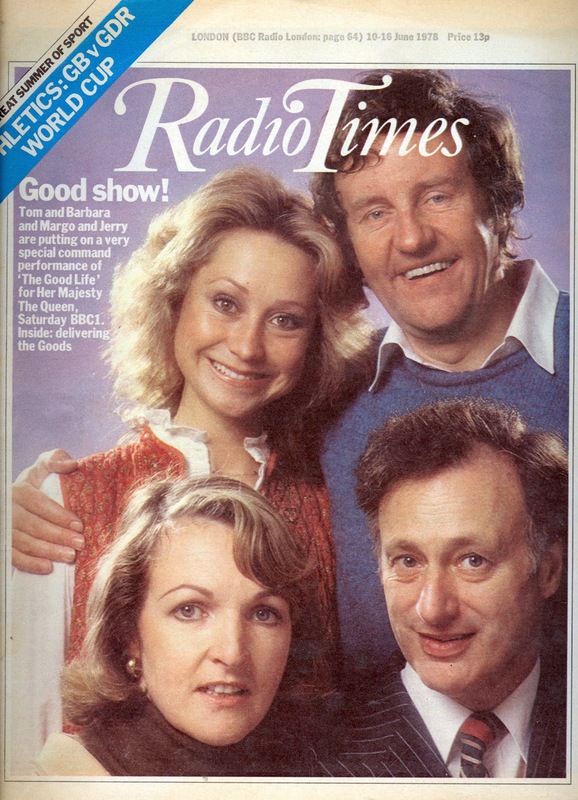 The Good Life was not just a BBC Comedy series, it became an institution. Families around London tried the self-sufficiency movement and some still live it acknowledging that this series was got them interested in trying out the lifestyle. The premise may seem very 1970s but actually could easily make for a great series today. It was about two people who wanted to live their lives their own way on their own terms. How many people can say they truly do that? Raise your glasses for a toast. To, the good life! I consider the final episode of The Good Life to be The Anniversary. I write a little bit about it here. 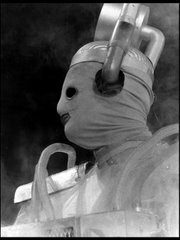 Next week: I will publish my fifth article in the 50WHO series of articles celebrating 50 years of Doctor Who. This time I focus my attention on Matt Smith as I recall the time I sat down with him at a bar in New York and had drinks. Well, not just Matt but Karen and Moffat too. The joke about Jimmy Savile is that in the 70s/80s he hosted a TV request show 'Jim'll Fix It' where viewers could write in a ask to meet a pop star or footballer. I suppose the joke is that Richard Briers is about to say "Every week we've been writing to Jimmy Savile asking to meet the Queen" but he doesn't finish the line before the audience anticipate and acknowledge what he's going to say. Very often at 'Royal Command Performances' references were made about the Royal Family as a gentle joke as it wasn't 'done' to talk about them directly. I don't know why, possibly Royal etiquette or something. Any jokes were therefore very vague with lots of hints for the audience to understand and be 'in on the joke'. Hope this makes sense. Thank you very much for the clarification. I figured it was something to do with Jim'll Fix It but it seemed ambiguous enough where I didn't want to guess and be wrong.